Veneers are one of the most aesthetic option available today. They are thin, semi-translucent laminates that are permanently bonded to your teeth. • Align crooked or misaligned teeth. 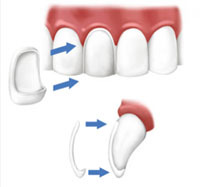 In terms of the process to place veneers, it is a process that takes approximately 2-3 visits. During the first visit, the preparation of the tooth/ teeth will start under shots of anaesthesia to minimize sensitivity and pain, the next step is to take an impression of the newly prepared teeth. During the second visit, and as the veneers are finalized, we will make every effort to make sure that your new veneers will feel just like your natural teeth. We will bond them into place ensuring that you can enjoy your new smile for a very long time! When bonded to the front surface of your teeth, they become incredibly strong and durable. Therefore, this is an ideal solution to capture the look you have always wanted, with only minimal disturbance to your tooth surface.